When it comes to managing your program, organizing groups, or dividing into teams, Color My Class equipment makes the job easy. Our Color My Class selection offers a wide variety of equipment that can assist with skill development, assessment, and field day, it’s an added bonus for any physical education program. Each set includes each color: Blue, Green, Orange, Purple, Red and Yellow. Our toughest most durable playground ball! • Our toughest most durable playground ball! • Designed to withstand all high-impact playground activities • Color Options: Blue, Green, Orange, Purple, Red, Yellow. 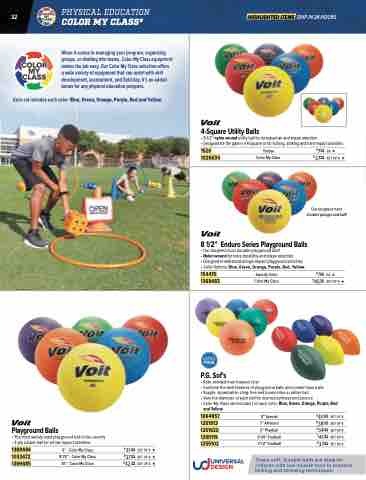 These soft, durable balls are ideal for children with low muscle tone to practice kicking and throwing techniques.